Hand made paper photo frames with floral designs at the corner in contrasting colors of pink over beige base. 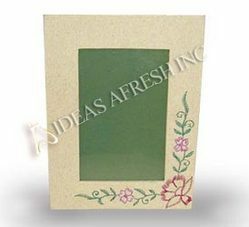 Manufactured from high quality Handmade Paper Photo Frames are available in unique designs and patterns. Highly attractive and useful, these are suitable for gifting and home decor purposes. Papier mache Hand painted Picture Frames. Size Available: 9" x 7" , 8" x 6" , 7" x 5", 6" x 4"
- Application- Use for decor , wall decor , photo Holoder , Table Photo holder , gift item , corporate gift , personalized gift , wedding gift , etc. Matching up with the requirements of our clients, we are involved in offering Designer Photo Frame. Handmade Paper Photo Frames offered come with interesting painted borders. Available in different intricate design work on the borders, these frames coordinate well with any type of interior décor and can also be made available in various standard and customized shapes and designs. Handmade paper photo frame in marble. We have lot of colour variants and in photo frame. Meticulously crafted, this captivating photo frames are ideal to frame favorite pictures and keep the memories fresh forever. The best way to treasure your memories is to keep them in Handmade Paper Photo Frame, so that you can have a look upon them whenever you feel like. 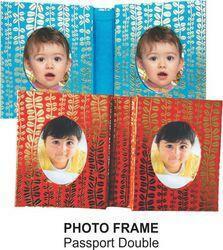 We are reckoned as the prime Manufacturer, Exporter and Supplier of the beautiful Photo Frames in India and abroad. Our Photo Frames are offered at pocket friendly prices.